It’s crunch-time at Old Trafford. As Manchester United and Liverpool gear up for one of the biggest games of the season, we’re taking a look at the football boots that could play a central role in some of the action. It just doesn’t get much bigger than the North West Derby. The rivalry between Manchester United and Liverpool has roots that go way beyond football, but the fact that these are the two most successful English teams in history certainly adds a certain spice to the occasion. Neither side are still harbouring hopes of clinching the Premier League title this season, but it’s still going to be a fiery affair as these two giants go toe-to-toe yet again. Liverpool dominated the English game throughout the 70’s and 80’s, but have failed to claim a single title since the top flight was repackaged as the Premier League back in 1992. It was then United’s turn to dominate, miraculously overhauling Liverpool’s trophy-count to become the most successful side in English football. However, in the past few seasons, both sides have gone a little off the boil, standing by as Chelsea, Manchester City and even Leicester City finished top of the pile. But that hasn’t removed any of the passion or desire that always embroils this fixture, and this weekend we’re hoping to see two sides going at each other with all guns blazing. Since adidas sponsor Manchester United, it stands to reason that their most popular silos will stand out prominently at Old Trafford. Well, nothing quite grabs the attention like a pair of adidas Predator boots, and these could prove key in the battle for midfield dominance. Nemanja Matic scored an absolute belter against Crystal Palace on Monday, sealing a last-gasp win and ensuring the Red Devils enter Saturday’s game full of confidence. He was sporting his own pair of adidas ‘Cold Blooded’ Predator’s, while counter-part Paul Pogba was wearing exactly the same boots. The performance of these two will prove pivotal to the outcome on Saturday, while Liverpool keeper Loris Karius will be hoping to keep them at bay in his own pair of Predators. The only question is: will we be seeing the new ‘Nite Crawler’ design? The adidas Nemeziz has been incredibly popular this season- well, what else would you expect from the boots Lionel Messi endorses? Roberto Firmino has been one of the poster-boys for the various new Nemeziz colourways throughout the year, and it’s not hard to see why. The Brazilian forward has been having an exceptional season, especially considering this is his first full year deployed as a lone-striker. He’s been sporting the ‘Cold Blooded’ Nemeziz in recent weeks, becoming famous for his trademark ‘no-look’ goals. In a slightly different shade of red, Jesse Lingard has also been surprising a few with his performances this season. In both cases, the adidas Nemeziz has allowed these players to utilise their agility and movement, and only time will tell who’ll come out on top this Saturday. It’s been all over social media, all over advertising hoardings and all over our boot wish-lists. So, it’s only fitting that the Nike ‘Born’ Mercurial should be all over the pitch at Old Trafford. Alexis Sanchez will be hoping to improve on recent performances, while Romelu Lukaku has been in fine form in recent weeks. Crystal Palace 2-3 Manchester United. Liverpool’s Emre Can has also improved this year, going viral during the week for pulling off the cheekiest of nutmegs on FC Porto’s Andre Andre. Can vs Pogba looks set to be a truly memorable midfield battle, with Nike and adidas going directly head to head in that regard as well. We just can’t talk about the North West Derby without mentioning Mo Salah. The ‘Egyptian Magician’ has been a revelation since his summer transfer from AS Roma, climbing to the top of the Premier League scoring charts and dazzling opponents in the Champions League. Salah scored yet again last weekend as Liverpool faced Newcastle United, dancing through defenders in his pair of adidas ‘Cold Blooded’ X boots. We all know that these bad boys are all about speed and agility, and Salah will be hoping to use this to expose United’s weakness at left-back. He’s guaranteed to score- because, well, he always scores. 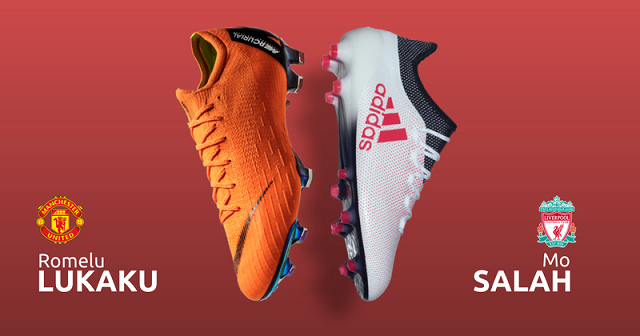 If you’re hoping to get your hands on any of the above football boots, then you can compare prices with FOOTY.COM to make sure you get the best deal possible! It’s time to play like your heroes with a bit of extra change left in your pocket.